It is now spring, although it's still chilly in Manchester! 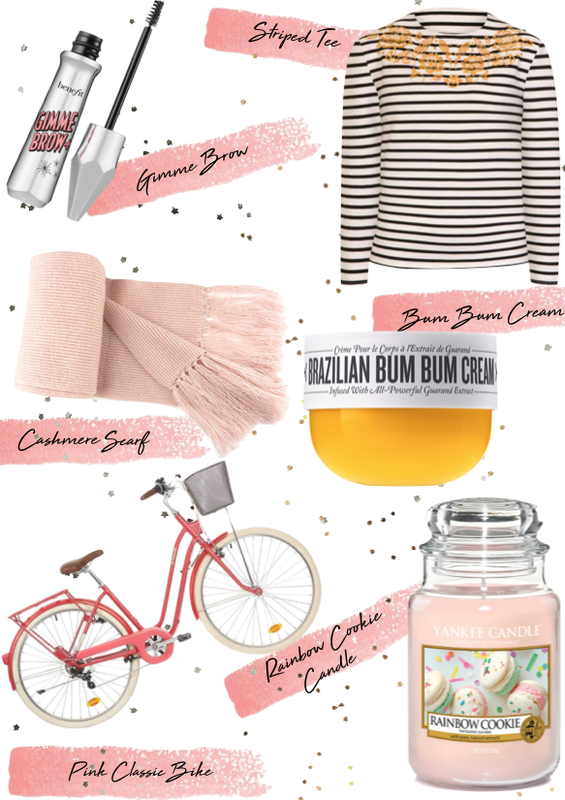 My spring clothing, accessories, beauty and homeware wish list is a little long but here are some of the items that are at the top of my wish list for spring 2018 from a range of brands including Yankee Candle, Benefit, Joanie Clothing, Decathlon and I Love Cashmere. To me, spring is such a refreshing, light and pastel season so that's why most of the items on my wish list are pink! The largest item on my wish list is this adorable dutch style bike from Decathlon which would be ideal for spring evening bike rides. Another pink item I've been wanting to buy recently is from the new 'enjoy the simple things' collection from Yankee Candle - all of the scents sound amazing. For beauty products I have so many on my wish list including the It Cosmetics CC Cream, the Lush Twilight Body Spray and the Lush easter range among others but the item at the very top of my list is an unusual product, the Brazilian Bum Bum Cream. Benefit recently re-released their amazing Gimme Brow which I love so I might have to re-purchase. Lastly for clothing, we all know I adore stripes and this cute stripy tee from Joanie Clothing was obviously going to be on my wish list. Finally for today's post is a gorgeous cashmere scarf from I Love Cashmere which is soft, luxurious and the perfect shade. It would be ideal for spring in the north of England as it's still going to be a little chilly and a scarf will be needed. They have a wide range of scarves and accessories to choose from, check out their website for more information. What do you think of my spring wish list? What beauty, clothing or homeware items are on your spring wish list? The pink bike is so cute. I really want to try some Benefit brow products too. I really want to try the Brazilian Bum Bum Cream too! Everyone is talking about it. Definitely need to invest in a new Yankee Candle jar. I got my mum some tea-lights and they smell really Springy. I really want to try the Brazillian Bum Bum cream too and the new IT cosmetics cc cream sounds amazing! I absolutely love gimme brow., it fills in those small sparse spots so well! I like Gimme Brow but I think it is overpriced for what it is. The Rimmel or Essence versions work just the same. Yes to the Bum Bum Cream, it smells heavenly! I have gimme brow & I love it! Really want to try that bum bum cream the name is fab!!! I’ve nevwr tried Gimme Brow !